Highlighting recruitment of tenure-track faculty, new degree programs, facility enhancements on campus and the University’s first-ever Principles of Community, Fresno State President Joseph I. Castro addressed the University’s faculty and staff who gathered in the Satellite Student Union on Jan. 16 for the annual spring semester assembly. “The success of our students will continue to be determined by big and bold personal dreams, a nurturing family environment, hard work and faculty and staff who are supportive and fully committed to discovery, diversity and distinction,” Castro said. Faculty and staff gathered at the event to hear Castro’s vision for the year ahead and to engage in a question and answer session leading up to the first day of semester instruction on Jan. 17. After taking a look back at the challenges the University faced after the Great Recession, Castro pointed out that, thanks to a modest increase every year from the state budget, student applications, enrollments and graduation rates have increased significantly, salaries for faculty and staff have increased steadily and many new faculty and staff have been hired. Between 2013 and 2018, Fresno State hired more tenure-track faculty than all but one other CSU campus. Castro went on to describe new degree programs that have been recently developed. An online degree-completion program has been developed for former Fresno State students who previously left the University in good academic standing so they can now complete their degree in a more timely way. A small group of qualified students will start the new degree-completion program this fall. After assessing the success of the new cohort, the University will consider expanding the program to more former students throughout the Central Valley. New degree programs have also been recently developed at Fresno State’s Visalia campus. The programs include business, teacher education, multilingual/multicultural education and a planned RN/BSN program in nursing. Several new construction and design projects are underway this year in order to meet the needs of 21st century teaching and learning. High-impact science and engineering laboratories will be renovated to support students and faculty. Also, a request for proposals will be released for a public-private partnership for a new $125 million Central Utility Plant, which will provide heating and cooling across the campus in a more cost-effective and environmentally sustained way. 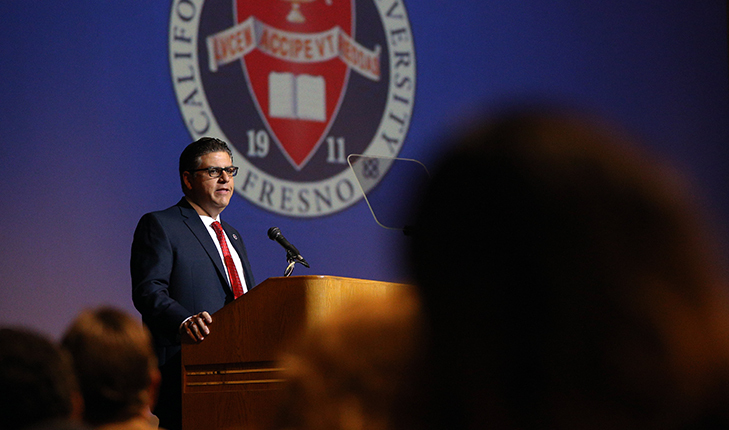 “This year, the design phase for the new student union will begin, a feasibility study for a new performing arts facility will be initiated, bidding for the Ruiz Executive Classroom building has begun and the construction of a new locker room for the equestrian team is underway,” Castro added. Castro also announced the University’s first Principles of Community, an aspirational set of guidelines that were developed by a taskforce made up of faculty and staff. Developing the principles was one of several action items stemming from the 2017 Working Quality Survey. The goal of the survey was to better understand faculty and staff perceptions of their work environment. Over the course of the ensuing two years, dozens of work groups and thousands of employees participated in discussions around how employees communicate and interact with one another. Castro emphasized the new Principles of Community are not a policy and are not to be intended to be enforced as such. Castro proceeded to recognize four faculty and staff members “whose daily work models the aspirations set forth by the University’s Principles of Community.” Those recognized included: Dr. Benjamin Boone, professor of music performance and composition; Louise Pacheco, recruitment counselor in the Office of Admissions and Recruitment; Ashley Ilic, director of Brand Strategy and Marketing; and Larry Salinas, executive director of Governmental Relations.